Financial sanity and stability may not return, but we can protect our assets and learn from the discussion. The DOW, S&P500, NASDAQ and other markets sell at all-time highs. However, we know many imbalances exist within our financial world. “In an ideal world there would be some radical changes. The best thing for the US in the (famous) long run is to go “cold turkey.” To abolish the Federal Reserve, fire its thousands of employees with their worthless PhDs. Return to 100% reserve banking with a strict separation of demand and time deposits. Depoliticize money by using gold, not Federal Reserve Notes. And default on the national debt, which is rewarding crony capitalists, and will turn future generations of Americans into serfs. And massively deregulate. And abolish the income tax, while cutting spending 90%. Etc. Etc. It’s easy to see there is no chance for a return to financial sanity as defined by Casey. “Accept that another nation’s business is not your affair. Cease all military spending, other than required for purely defensive purposes. The resources and technologies released by this move would be redirected by entrepreneurs for the service and benefit of consumers. Deregulate, making it clear that individuals must look out for themselves. The state is useless at protecting the consumer. Companies that plan to prosper will realize their reputations for fairness and honesty are paramount, instead of hiding behind regulations. Encourage family cohesion, instead of automatically expecting the state to look after your elderly, your handicapped and your children. Socializing family values is not the business of the state, which cannot deliver welfare services effectively. Make it clear to the banks and their customers there is no lender of last resort, and no deposit guarantees. Deregulation of financial services and the removal of this safety net will force banks to stop speculating in financial markets and be conservative in their financial gearing, to protect their reputations. Interbank loan rates will penalize financial aggression. Yup, he’s not expecting a return to financial sanity. Macleod sees “money printing” and inflation in our future – with Zimbabwe and Venezuela leading the way. Oops! The process and direction are clear. The uncertainty revolves around the timing and degree of the inflationary disaster. Consumer price inflation is here to stay. 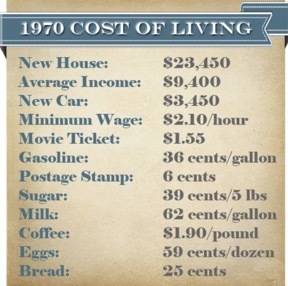 Consider prices from 1970 to show how consumer price inflation is “hard-wired” into our financial system. The U.S. increased debt securities by $12.5 trillion in about nine years and levitated the S&P by 1,700+ points. The consequences of that debt creation will manifest in coming years. Total debt securities have increased at a compounded rate of 6% per year for over two decades. At that rate current debt of $44 trillion will grow to over $66 trillion in 2025. That massive increase in debt (currency in circulation) will create the price inflation that Casey and Macleod foresee in our future. But, add a teaspoon of panic to the inevitable debt increases, mix with a double-handful of fear, stir in several cups of counter-party risk, add five heaping tablespoons of central bank and government intervention, and bake this toxic cake in the central banker oven for a few years. The result will be a huge boost in consumer price inflation and large increases in gold and silver prices. Expect inflation, possibly hyperinflation, asset price crashes, and reflation of equity bubbles. Central bankers will be prodded by politicians to “do something,” and they will, to the detriment of most people. The result is predictable since the world will choose not to act on the suggestions from Casey and Macleod. Governments and central banks will choose inflation and continued currency devaluations. However, we can protect our savings and retirement. Consider the long-term correlation between total debt securities and gold prices. 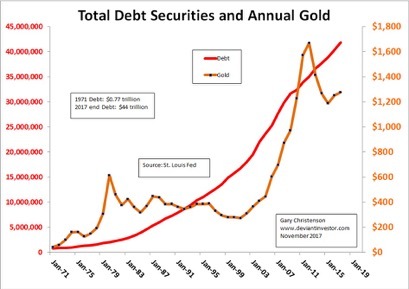 Panic, fear and “out of control” debt increases will drive gold prices higher. This will accelerate when central bankers and governments lose remaining credibility. 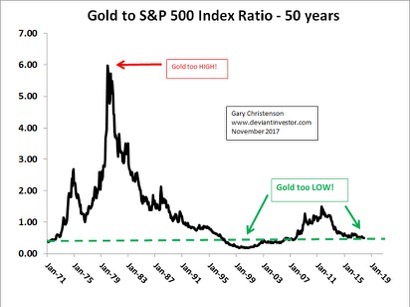 Expect the gold to S&P 500 Index ratio to move much higher in coming years. We should expect a rise in volatility, consumer price inflation, massive central bank printing, and more debt … lots more debt. Gold and silver prices will rise! Casey and Macleod have defined what is necessary to correct our self-created fiscal and monetary insanity. Expect massive “money printing,” stock and bond crashes, asset price levitations, inflation, and possibly hyperinflation. Timing: Coming soon to our world, probably in 2018. Debt increases exponentially. Gold prices follow, occasionally zooming ahead of debt and then collapsing, but always tracking the inevitably increasing debt and devaluation of fiat currencies. Gold will rise compared to the S&P 500 Index in coming years. Gold and silver will help protect your savings, retirement, and purchasing power. Their prices will fly much higher when the coming category five crises devastate our financial system.